“Polymict” is a small exhibition, and its component works in Okay Mountain’s garage space feel distilled, as though melted down to make an elixir. Enter the word polymict, a geologic space composed of layers of rock from different sources. Curator Nathan Green installed half the show (five paintings each by Logan Grider and Ludwig Schwarz), and then invited Warren Aldrich and Lillian Gerson to build an installation that responds to the canvases. Green complicates the motif of geologic layering with the idea of layers in general, placing Grider and Schwarz’s bright abstract works along three walls to form an unstable framing surface. The distribution of sculptures in front of this artificial bracket causes a push-and-pull between surface and layers. The works feel beautifully attenuated while compacting, swirling together, and stamping one another flat. The two- and three-dimensional works have a successful and perfectly artificial conversation. 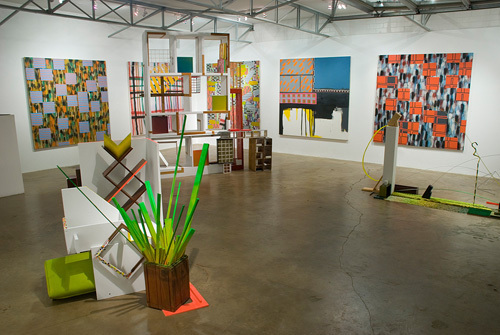 Aldrich and Gerson’s structure in front of Schwarz’s untitled paintings, for instance, uses grids and decorative elements to elicit a kind of Sol LeWitt–on-acid effect. Interlacing palettes of white, melon, lime green, candy-apple red, and baby blue that are at once rangy and twee, the vehicles for these colors (mostly geometric forms) battle between aesthetic allure and spatial collapse.